(Feb. 6th, 2010) - Ardbeg Rollercoaster Launches for the Committee (on Feb. 15th). "The Ardbeg bottling of the decade!" 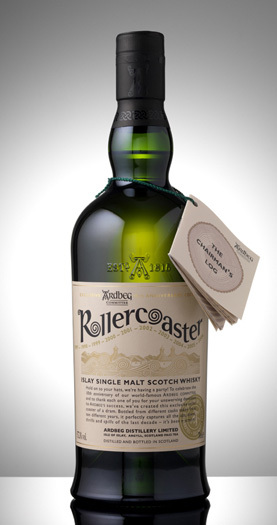 The Ardbeg Rollercoaster was officially launched and released on February 15th. It went on sale at the Distillery on the same day for �50 GBP, and there was a limit of 2 per Committee member. The allocation in the UK was 12,000 bottles. This whisky was bottled at 57.3%, and it contains casks from 1997-2006, with the breakdown of cask types and percentages listed below. Click on the picture above to visit Ardbeg's page on the Rollercoaster. Tune in later for The Ardbeg Project page of both the UK and US releases. Bottle Codes for Rollercoaster Committee, including any other Expressions bottled on the same day or within hours of the Rollercoaster.